I've always wondered how books get co-authored when there are two writers involved. Perhaps one person writes the dialogue, and the other handles descriptive passages. Maybe they take turns with each chapter, paragraph, or sentence (word or letter would be impressive). It reminds me of games I played in my youth where we'd tell or write a story one paragraph, or if we were really daring, one sentence at a time. And of course, when we were finished, we'd had a hilarious time but amazingly enough fell short of writing something Pullitzer-worthy. Well, Hunter's Run has 3 authors, somehow. 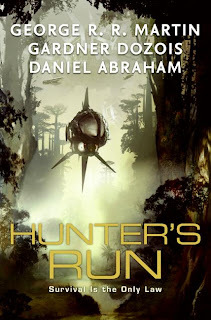 George R. R. Martin and Gardner Dozois are both highly experienced, while Daniel Abraham appears to be a talented new author. Still, like Il Divo, a superbly talented cast doesn't guarantee anything. Especially where, in my experience, one person typically does a better job than three. I suspect this book has to do with fulfilling contracts - when creative output dries up, share the burden. Three people get credit for one book, and as I would guess from my experiences working in groups, the young guy probably had to do most of the work. Pure libelous speculation on my part there, but it sounds right to me. Anyway, I found out about the book from Martin's A Song of Fire and Ice blog, where I occasionally search desparately for any news about the second half of the book he published in 2005, which followed the preceeding book from 2000. Well, it's not ready yet, but in the meantime, why don't we try out this book that he was a part of? A recent 2008 release. I couldn't help myself. I love Martin's fantasy, so I took his recommendation. What about Hunter's Run, you ask? Is it a book about someone's daughter? Well, not quite. Actually it is about Ramón, a tough latino colonist with an obvious ghetto upbringing just trying to survive two alien races, the law, a crazy girlfriend, and a trek through the uncharted wilderness of São Paulo. There were some neat twists that kept it interesting, and plenty of action. I didn't mind the language, the violence, the sexual references, or the crudeness that show the reader how tough life is for the colonists. It was done convincingly, or as well as it needed to be, since I have no earthly idea what coming from that kind of background would be like. Yet in the end I was only marginally satisfied with the book. One downside was the lack of resolution in so many areas. I felt like the situation at the end was nearly the same as the beginning: nothing changed for the aliens, Ramón heads out into unknown territory with potential for good things to happen, there's still a crazy girlfriend and bad blood between him and the law. What did he struggle so hard to acheive? The end hints at good things happening, so I guess I'll have to decide that's what comes next: he gets rich and the hiding aliens won't be discovered for a long time. Not that that settles anything with the Enye, really, just prolongs the inevitable. And I wouldn't have minded some justice or revenge against the child-eating, enslaving lying manipulators. And I wouldn't have minded knowing why they are so intent on eradicating this one particular alien civilization. Was it because they could sense the "flow" of things and align themselves to it? WHY? The action seems thrown in to keep it interesting, as do the elements meant for shock value, such as the barfight murder, the sensory deprivation chamber, and the neck leash thing known as a sahael. I also found it strange that the aliens could translate to English to communicate with Ramón, yet certain words remained in the alien's own tongue. Yet I could work out an equivalent with no problem, so were the words left untranslated just to make them seem more, well, alien? Lastly, I felt a bit annoyed at the gradual return of Ramón's memory, where his memory of that crucial night of the fight returns near the end. Too much like being baited, I didn't care for the tease that it was throughout the book. And a conveniently timed recall, too, twenty pages from the end! Nobody who's a part of this blog group is going to read this novel, I'm fairly certain. If some Sci-fi fan ever comes across my review, I'd say give it a shot if you want a quick, easy read. Just don't expect an epic tale involving a creative use of our most current scientific knowledge. This book was too ordinary for that. I don't regret reading it, but I don't highly recommend it either. Well, it could've been about someone's daughter - there is a crazy girlfriend, you know? You guys can be all smug because you have all boys. Anyway, I've wondered how the co-authoring thing works myself. It seems like a formula for mediocre writing. I think I would be too much of a control freak about my writing to be a very good collaborator. I don't think it's always a formulaic thing. I don't know if I could co-write a book, but I think with people who have good karma between them, they could work well together. It would certainly be interesting.